“The famous guitarist Antonio Chocano used to play in the Máquina Real theatre, in front of the oratorio of the Caballero de Gracia. 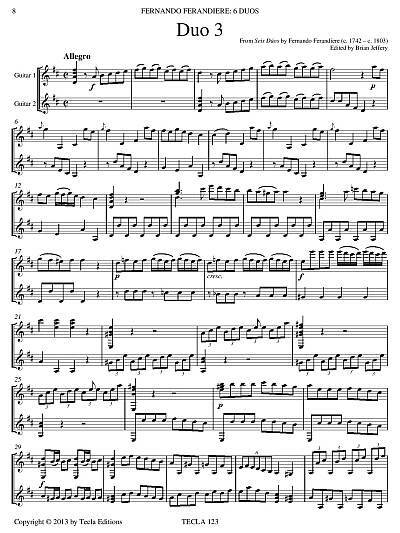 On Sundays his friends used to go to the house of the publisher Fiola in the plazuela del Carmen, where they heard him play in [probably friendly] competition with another accomplished master, Fernando Ferandiere” (from the introduction to this edition). These duets come from a manuscript which, possibly, may have been Chocano’s copy. 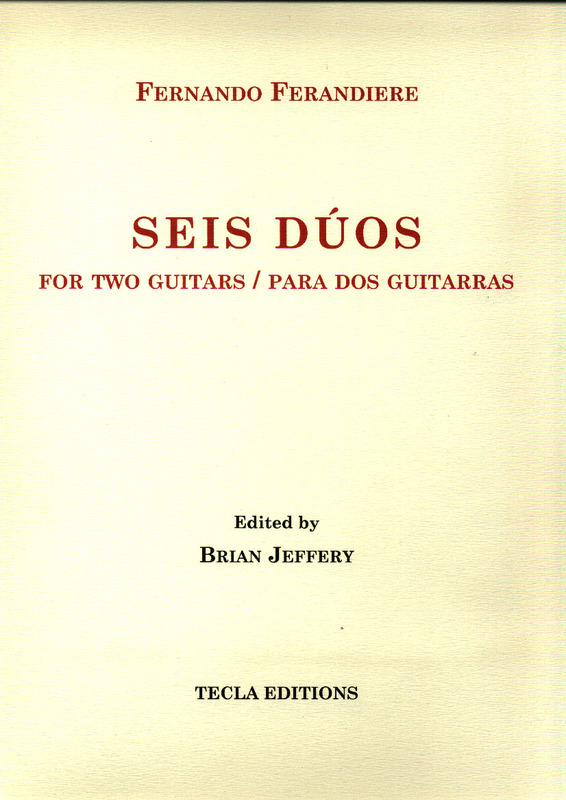 This edition presents Fernando Ferandiere’s Seis Dúos for two guitars from about 1800, full of life, originality and humour. They come from a manuscript now in Madrid. This is a new modern edition by Brian Jeffery and is re-engraved (not facsimile). These duos have not previously been published in a modern edition as far as I know. Score. 32 pages with a detachable insert of 28 pages for the use of Guitar 2. Large music size 24 x 31 cm. A handsome new edition on high quality paper, paperbound. With an introduction by Brian Jeffery. First published by Tecla Editions in 2013. Read the beginning of the preface. Printed by Artes Gráficas Soler in Valencia Spain, a printer specializing in fine printing for over a hundred years.